This year all of the topics on the prompt list are song titles! Each day is given a song title that you can interpret however you like. You can take inspiration from the title alone, from the lyrics, or the atmosphere of the song. You can find a Spotify playlist with all the songs here, and you can find a printer-friendly list here. #Mapvember is an open challenge for all who enjoy drawing fictional maps for roleplaying games. These maps can be anything from dungeon maps to geographical maps, from fantasy to science fiction, as long as the maps are usable without other maps, tools or information. This is not a competition, so there are no winners or losers. But hopefully, there will be a bunch of inspired people with burning desire to draw more maps or use the maps shared by others in their own games. 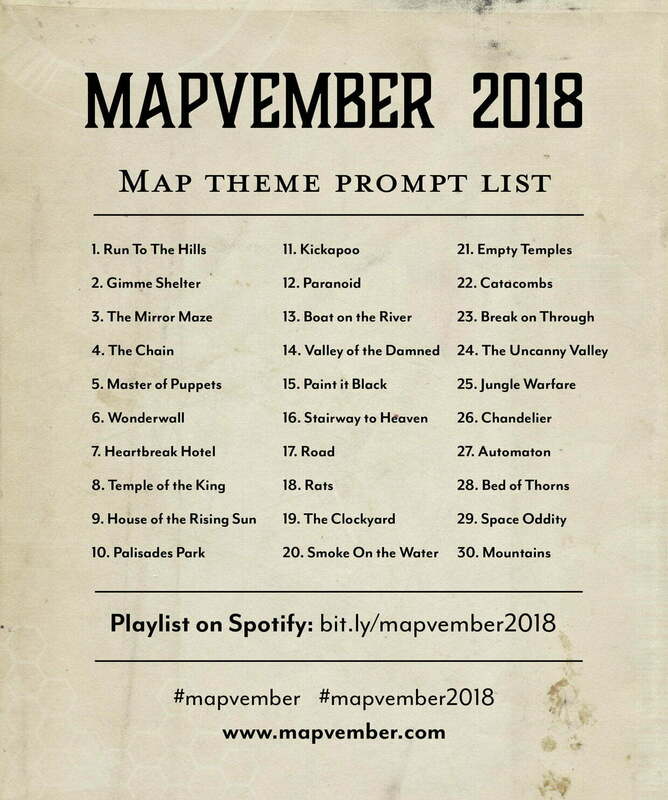 Tag your map with a hashtag #mapvember and/or #mapvember2018. Ok. What kind of maps I should do? There really are no rules to what kind of maps you should do. You can do whatever inspires you. If you are out of ideas, you can find a list of themes and topics above. #mapvember is about making maps, not about the tools you use. As long as you actually design and make the map yourself, using digital tools is just fine. That’s pretty much it. Let’s have fun!